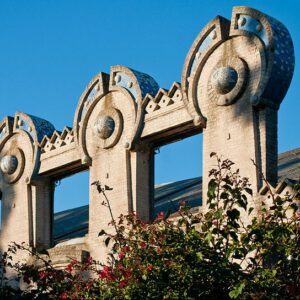 This summer, the artnouveau.club team, with the help of its large number of social networks followers, has created the first Ranking of American Art Nouveau cities. The results have been presented today in Barcelona, during the City’s Annual Festival that takes place every October 24. From an initial list of over 40 cities and towns, 11 were pre-selected, and a ranking has been made according to their Art Nouveau heritage and attractiveness. Ranking them has not an easy task but many aspects have been analyzed in the process. One of the main learnings of the results is that Argentina is on top, with two cities in the TOP 3 and three in the TOP 11. In the American continent (USA may be the only exception on that) economic growth generated a new social class of rich people and this was the spark that ignited a revolution in the Arts world, mainly leading in the use of Art Nouveau in architecture. Also with USA as an exception, Art Nouveau was introduced in America by the many European architects who began working in the continent from the 1860s. They were architects mainly from France, Italy, Belgium, Catalonia and Hungary. As it happened in Europe, in America the Art Nouveau movement also had a short life, but some very remarkable buildings remain in these cities. In the same way that happened in Portugal, Art Nouveau arrived late in America, with the best examples of Art Nouveau to be found after 1905 (more than a decade after Brussels, Paris or Barcelona), but lasted a decade more than in Europe, where it is commonly stated that it ended when the King of the Austro-Hungarian Empire was assassinated in 1914. With the advance of the nineteenth century and the arrival of new technologies, the architecture of iron gave a new appearance to the cities and was used in markets, train stations, hospitals, theaters, town halls, and other constructions. Art Nouveau has been recognized by historians as an important bridge between the progression of Neoclassical aesthetics and Modernism. This happened in America as it did in Europe. About the picture above – Av. Rivadavia 2017, built in 1907 by Eduardo Rodríguez Ortega. Back at the end of the 19th century and during the first decades of the 20th century, Buenos Aires was one of the most important and wealthiest capital cities in the world. This explains how this magnificent metropolis in the southern hemisphere got to have such an abundant Art Nouveau architecture. As Argentina’s port and capital, Buenos Aires welcomed all artistic and architectural European styles in a cosmopolitan way. European immigrants brought with them examples and images from their home countries and introduced them into the life of the early 1900’s. The prototype city that took hold towards the end of the 19th century was French in influence, with the city’s urban layout defined by large boulevards and avenues. Torcuato de Alvear, mayor of Buenos Aires between 1883 and 1887, built the Mayo, Alvear and Sarmiento Avenues, as well as public squares and parks, as Haussmann had done in Paris. Work intensified at the turn of the century with the construction of government buildings, theaters, shopping centers, train stations, and large apartment buildings. The eclecticism of Buenos Aires’ French roots inevitably became the city’s dominant style, against which an anti-academic backlash began. The influence of European Art Nouveau culminated in the 1920s, when the city enthusiastically embraced it. Buenos Aires’ most notable architecture is a mix of neoclassical, Art Nouveau and Art Deco. Today their crumbling facades evoke a sense of faded glamour from a time long passed which make it a very attractive destination. The large presence of Italians and Catalans in Argentina meant that the city was not only influenced by French Art Nouveau but also by Italian Liberty and Catalan Modernisme designs, as can be seen in the Galería Güemes (1915), by the architect Francisco Gianotti, or the Palacio de los Lirios (1905), by the engineer Rodríguez Ortega. The most prolific architect at the time, Virginio Colombo, was also Italian, and he designed the apartment block at Calle Hipólito Yrigoyen, 2562 (1911). Mario Palanti was also Italian and amongst his works there was one of the most monumental constructions of the times, the Pasaje Barolo (1923), in a style that is very close to Expressionism. Catalan influence arrived in the form of the architect Julián Jaime García Núñez, who completed his studies in Barcelona in 1900. Highlights of his work include the office block at Calle Chacabuco, 70-78 (1910), with its iron and glass interior courtyard, as the very Barcelona-styled Casal Català (1929), designed in collaboration with Eugenio Campllonch. In 1905 Eduardo Rodríguez Ortega (1871-1938) built Casa de los Lirios is an icon of Catalan modernism in the City. 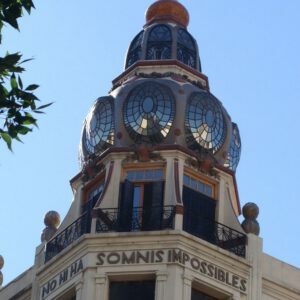 the architect Fernando Lorenzi restored it in 1999 and incorporated the phrase “No hi ha somnis impossibles” (There are no impossible dreams, in Catalan). The lilies are obvious. Like the neighboring cupola, in Rivadavia and Ayacucho, one of the most beautiful in Buenos Aires and another tribute from Rodríguez Ortega to Gaudí. In Argentina, the is the very active Association of Art Nouveau in Buenos Aires. Before going to Argentina, check the following LINK. About the picture above – Buildings designed in 1914 and located in 107, Cárdenas street, in Old Havana. At the beginning of the 20th century, Havana was a modern city with well-defined neighborhoods, an historical centre and some newer districts where the new middle-classes living zones. 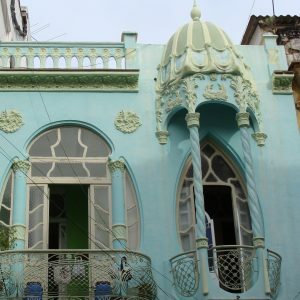 1900’s and 1920’s were the years of Art Nouveau in La Havana. Almost all the Art Nouveau constructions built were for residential purposes. Its new status as capital helped to create a new form of public architecture that, as was common in Western cultures, adopted eclectic styles. 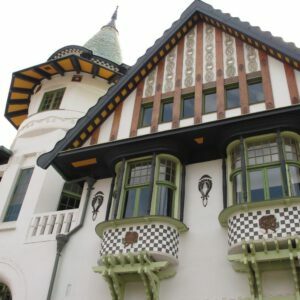 Catalan architects were key in the introduction of Art Nouveau in the city, a result of major emigration to Cuba by Catalans since the previous century. This new style also contributed to the strong growth of local decorative arts, many of which were in the hands of owners who had Catalan origins. The city’s new enlargement areas, or repartos, as they were known – Vedado and Carmelo from 1859 and Miramar, Country Club Park, La Playa and La Vívora from the beginning of the 20th century – designed a new city that had wide, tree-lined avenues and public parks, which helped to modernise the city’s image and at the same time favour the construction industry. This new design style was wisely adapted to the city’s typical Caribbean houses, which were characterised by beautiful porches. Art Nouveau began to develop in La Havana around 1910 lasting only ten years. Mario Rotllant i Folcarà was a Catalan trained sculptor, but he also designed major works such as the Casa Gutiérrez Cano (1913) and, together with the architect Ignacio de la Vega, the Masia L’Ampurdà (1919), whose benches were very directly influenced by Park Güell. Narciso Bou and Ramon Magriñà were also Catalan architects very active in Cuba. Amongst local professionals, one person who should be mentioned is the master builder Eugenio Dediot, who designed the El Cetro de Oro (1910), a residential building with ground-floor shops whose commissioning client was a native Catalan. This brief and extraordinarily productive Modernista phase ended with the creation of Havana’s School of Architecture in 1916, which brought an end to any unqualified architects designing buildings. Baltazar Ustrell and other Catalans created workshops for the production of prefabricated decorative elements, decisive for the dissemination of modernism which led to the term of mould architecture. The main examples of Art Nouveau in La Havana are found along wide avenues in central city areas, but we can also find disseminated buildings in distant neighborhoods. In essential difference with Europe, Art Nouveau in Havana appears more as an elegant skin than a conception that organically impacts the form of space. The style is mainly circumscribed to an ornamentation superposed to neoclassical and eclectic facades. This tropical version is indebted to Catalan masters, which migrated from their native land between 1790 and 1840, looking for better economic opportunities. Art Nouveau appeared in carpentry, iron work, stain glass, ceramic tiles in floors, stairs balustrades and garden and urban furniture. It is also common to find them in interiors, in wood and metal furniture, lamps and in an incredible variety of utilitarian and decorative objects. There are a few places in Havana which concentrate exponents of this style. One of them is Cárdenas street , to the southwest limit of Havana ‘s Historic Centre; the other in Manrique street within the compact grid of Central Havana Municipality. These are unique examples of conjunction at urban level scarce as the Art Nouveau’s own print in the city. 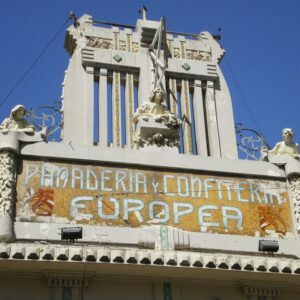 About the picture above – Confitería La Europea, built in 1916 by Francesc Roca i Simó. Located in San Luis, number 1157. Francisco Roca i Simó, a young Majorcan architect trained in Barcelona, is thought to be the person who introduced this new style in Rosario since his arrival at 1909. His main work was The Club Español (1913). There are more than 50 Art Nouveau buildings in Rosario mainly influenced by Stile Liberty, Italian Art Nouveau, and Modernisme, Catalan Art Nouveau. In terms of the applied arts, it is worth mentioning the work of the Barcelona sculptor Diego Masana. Other works by Roca i Simó are the Asociación Española de Socorros Mutuos, Palacio Cabanellas, Casa Remonda Montserrat, La Europea confectioner’s and the Castilla-Río de la Plata Bank. By 1880, Rosario had become the first export outlet of Argentina. Urban growth was made possible thanks to economic prosperity and in 1890 Rosario’s building regulations were formulated. Waves of immigration to the city soon followed and these were accompanied by a construction fever from an increasingly more powerful middle class. Despite a tradition of vernacular styles and the presence of eclectic architecture, Art Nouveau was introduced and well received in the city. The city’s economy and population expanded at an accelerated rate. By 1887 it had about 50,000 inhabitants, of which 40% were immigrants, who brought new ideas from Europe and started turning Rosario into a politically progressive city. During part of the second half of the 19th century there was a movement promoting that the city of Rosario become the capital of the Republic. In the last 15 years of the 19th century, the city more than doubled in population. The population doubled again in about ten years, to about 200.000 inhabitants. Demographic growth took its toll of bad living conditions, epidemics of contagious diseases such as tuberculosis, and increased labour offer resulting in exploitation. About the picture above – paCarson, Pirie, Scott and Company – Sullivan Center, 1 S State St. Built 1899 by Louis Sullivan. In the United States, the firm of Louis Comfort Tiffany played a central role in American Art Nouveau. Born in 1848, he studied at the National Academy of Design in New York, began working with glass at the age of 24, entered the family business started by his father, and 1885 set up his own enterprise devoted to fine glass, and developed new techniques for its coloring. Being the son of the founder and owner of Tiffany’s and Co he had access to training, technology and clients to start his own business.In creating the glass, Tiffany melted down colored glass, rather than painting the glass, which had been the previous method of creating the bright colors. The Tiffany lamp in particular became one of the icons of the Art Nouveau, but Tiffany’s craftsworkers designed and made extraordinary windows, vases, and other glass art. Tiffany’s glass also had great success at the 1900 Exposition Universelle in Paris; his stained glass window called the Flight of Souls won a gold medal. 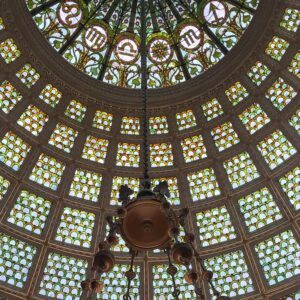 Chicago Cultural Center is Louis Comfort Tiffany’s largest known dome at 38 feet in diameter. 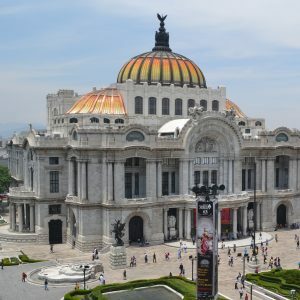 Some consider that his masterpiece was the enormous glass curtain fabricated in 1911 for the Palacio de Bellas Artes in Mexico City (see Mexico city in the ranking). In Chicago there are plenty of other Art Nouveau places to visit: Driehaus Museum Chicago, The Richard H. Driehaus Gallery of Stained Glass, Chicago Architecture Foundation, Macy’s State Street, The Marquette Building, The Palmer House Hilton, Second Presbyterian Church, to say some. The strains of European Art Nouveau soon found their way into American culture principally through ceramic and glass designs. The fondness for Orientalism, especially Japanese prints and ceramic glazing effects, influenced such leading figures as Louis Comfort Tiffany and others. Architect Louis H. Sullivan and his master ornamentalist, George Elmslie, introduced the Art Nouveau aesthetic to America’s heartland by integrating floral ornaments with cubic mass, a fusion of organic and inorganic superbly realized in The National Farmer’s Bank, now Norwest Bank Owatonna. About the picture above – The Palace of Fine Arts (National Theatre) was built by Italian architect Adamo Boari. Built between 1904-1910. It was given a nationalist touch, so that many ornaments are inspired by the Mexican flora and fauna, as well as pre-Hispanic motifs. The overall design maintains classic features but it has many Art Nouveau components. The modern building still contains the glass curtain built by Tiffany in New York, the theatre ceiling, the proscenium arch mosaic, the group of sculptures on the outside dome, which were made by Géza Maróti in Budapest, and the four Pegasus sculptures by the Catalan sculptor Agustí Querol. It was inaugurated during the celebrations of the Centennial of the Independence of Mexico (1910) and it was completed in an Art Deco style by Federico Mariscal in 1934. At the turn of the 19th to the 20th Centuries the ruling class of Mexico City imitated the forms of European capitals, especially Paris. This concern led to European trained architects arriving in the city, such as Italian Adamo Boari, who had already worked in Chicago and New York. The city was extended with the construction of the new middle- to upper-class inhabitants who included Art Nouveau elements in their façades, with undulating borders for openings and stylised plant forms. There are examples in Chihuahua, 78 and Bucareli, 116. The interior of the Gran Hotel de México, which is located in the old Centro Mercantil (1896-1897) building, by Garza i Gonzalo Garita, retains beautiful examples of the decorative arts, such as the ceiling of its main hall, skylight designed by Jaques Gruber, who was a member of the Ecole de Nancy (1908), or the forged iron and glass elevator. Conceived as a shopping centre with shops and offices, the building was constructed according to the Chicago structural system, involving a metallic grill upon which the steel structure is built. About the picture above – Casa Courret built by the French architect Enrique Ronderas in 1905, and located at Jirón de la Unión 461. It was the first Art Nouveau construction built in Lima. Another French architect that participated in the arrival of Art Nouveau in Lima was Claudio Sahut. Other large Art nouveau houses built in the city center were Casa Fernandini, Paláis Concert, Casa de los Atlantes and Casa Pygmalión. In the city centre new buildings were constructed following the demolition of old buildings due to various causes, such as tremors, earthquakes and fires, or simply due to the urban renewal of buildings in line with the citys social and urban development. These new buildings were adapted to the new trends of the early 20th century and housed residences. In some cases, Art Nouveau buildings were designed to accommodate businesses, shops and industries. The city center of Lima grew and also did the surrounding area. Also did the neighbouring towns, where ranches or leisure homes would came to be built. Various types of modernist buildings began to appear, ranging from large mansions to housing complexes, either in multi-departmental buildings sharing a common façade or in quintas, which comprised several buildings or blocks that maintained an architectural unity enclosed within a housing complex. Highlights include Casa Sal y Rosas, Casa Molina, Quinta Alania and Casa de Victoria Larco. About the picture above – Palacio Baburizza by Italian architectds in 1916 – Located in Monte Alegre, 132. 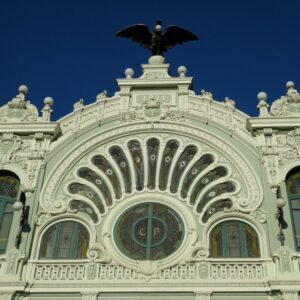 The best examples of Art Nouveau works in Valparaíso were designed by the Italian architects Renato Schiavon and Arnaldo Barison, both trained in Trieste. They arrived in the city because of the possibilities that existed there of receiving commissions for its reconstruction after an earthquake had left it in ruins in 1906. The most outstanding example of their combined work is the Barburizza Palace (1915), located on Paseo Yugoslavo and currently housing the city’s Fine Arts Museum. It is a beautiful example of the influences of Secessionist models and was commissioned by the saltpetre businessman Ottorino Zanelli and later purchased by Pascual Baburizza in 1925, hence its current name. Valparaíso’s old town was placed on UNESCO’s World Heritage List in 2003. Because of it strategic location in a natural bay, Valparaíso was the commercial and financial capital for Chile and, as a result, the country’s first banks and stock exchange were set up there, as were the offices of the country’s main companies. A great number of immigrants settled in Valparaíso to work in the export trade and they became wealthy by exploiting mining in the north of the country. Therefore, the city, which had 162,000 inhabitants in 1905, became a pioneer in terms of urban improvements (electric lighting, telephones, gas piping, etc) until the years until 1914. Due to the geographical layout of the area, the port city progressively began occupying the slopes of the over 40 hills that surrounded it as it grew. To overcome the great differences in ground levels within these areas of the city, a series of cable cars was built beginning in 1880, many of which still survive today. Official architecture in the city was based on eclectic and academic styles, while religious constructions adopted Medieval forms made from wood. The wealthy middle classes began to construct their own single dwelling homes on the slopes of Cerro Alegre and Cerro Concepción. About the picture above – Exhibition building in Rural del Prado, a work done by Cayetano Buigas, Juan María Aubriot and F. Gómez Ferrer, in 1913. Unlike European modernism, Uruguayan architecture lacked collaboration between the architect and the craftsman which led to difficulties in the use of iron and also to a lower ornamental richness. Some architects of the last third of the 19th century applied the Art Nouveau style that was popular in France, Italy and Catalonia, all of them very attached to historicist eclecticism. Some of the main architects were from Uruguay: Horacio Acosta and Lara, Américo Maini and Leopoldo J. Tosi. Tosi had a long career as a builder and engineer, and he loved Art Nouveau. In 1917 he designed a commercial building of Pablo Ferrando, located in Sarandí street number 675. Conceived with a central interior space, it is 3 tall floors in the form of a balcony over said space, a solution that can be guessed in the façade, which is widely glazed and with a metallic structure expressed to the exterior, all of which is reminiscent of the innovative houses of Victor Horta. Another important architect was Uruguayan Alfredo Jones Brown, who built the IAVA building, the Rex building and the public school of the Reducto. He did not travel to Europe, so he had no direct contact with European modernism, but he had contact with Catalan architects influenced by modernism who passed through Montevideo. One of them was Cayetano Buigas i Monravá, who built several buildings in Montevideo. He was the designer of the Pavilions of Exhibition of the Rural Association in the Prado (1913). The facades appear worked with geometric decoration of strong Art Nouveau inspirations, with classic decorative elements but incorporating the color and the brick. The cornice is very ornate and the roof is sloping, with colored tiles and skylights. The lines are organized symmetrically It is a style that looks like the Vertical style in Riga. An attempt to define a national architecture had not yet taken place at the end of the 19th century. 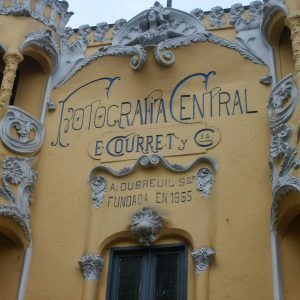 The renovation movements in Uruguay were very limited and for this reason only a few architects used Art Nouveau forms, and for a very short period that we can situate between 1900 and the First World War. About the picture above – ex City Hall Subway Station in the Lexington Avenue Line, at 230 Broadway. Built from 1900-04. Right under the City Hall there is a secret subway station called CITY HALL and built between 1900 and 1904. It was used until 1945 but in late 1998 the station was declared a “highly secure” area by the Giuliani administration, and closed for visitors. 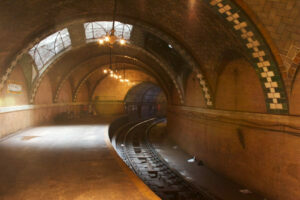 Currently, the subway station is not open for visitors, except for registered members of the New York Transit Museum. The station was designed by Rafael Guastavino, from Valencia, Spain. The main consulting architects on the IRT stations were George Lewis Heins and Christopher Grant LaFarge for the company Heins & LaFarge. This station is unusually elegant in architectural style, and is unique among the original IRT stations, employing Romanesque Revival architecture. The platform and mezzanine feature Guastavino tile, skylights, colored glass tilework and brass chandeliers. About the picture above – 307 South Broadway Los Angeles, California. It opened in February 1918. It was one of the first movie palaces built in the United States, and the first of Los Angeles, LA. 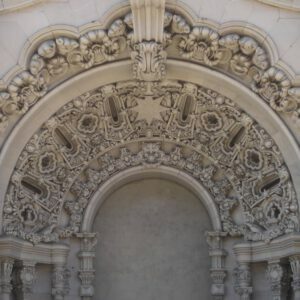 The building was designed by the American Albert C. Martin, Sr. with the exterior decorative elements by sculptor Joseph Mora. Los Angeles, L.A., like Miami, are much more popular for their Art déco, but still have some Art Nouveau as well. About the picture above – Casas Franklin (1911) in Av. Passos 36-38, one of the busiest avenues in the center of Rio. The most important element of the exuberant facade is a large stained glass windows with the shape of a large peacock tail. The building was built as Casa Lucas, a bazaar that sold electrical, hydraulic and hardware materials. In the 1980’s the Franklin Group acquired the property, but it was not until 2006 that it launched the house of events with capacity for up to 4,000 people that now houses great festivities in the city of Rio de Janeiro. Several buildings of Art Nouveau influence, mostly from the first decades of the 20th century can be seen in Centro and Lapa. 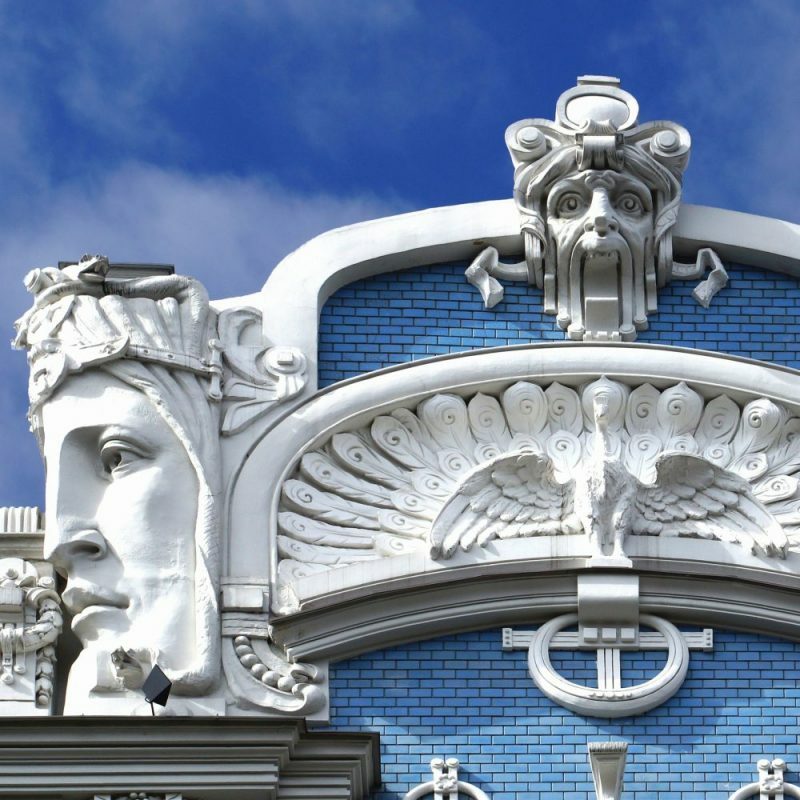 Art Deco and Art Nouveau, two very different styles that in Europe never co-existed, were used at the same time in Rio. They did it with no conflicts. Other Art Nouveau buildings in Río de Janeiro are Albamar Restaurant or Iris Cinema, but there are plenty of residential buildings. This is our Ranking of Art Nouveau Cities in America. Do you agree with it? This summer, the artnouveau.club team, composed by Guides and Experts in the Art Nouveau world, with the collaborations from several museums and a wide spectrum of Art Nouveau lovers (followers from the website offering Exclusive Art Nouveau private tours and members of their social networks, covering more than 50,000 followers), has ranked the American cities according to their Art Nouveau heritage and attractive. 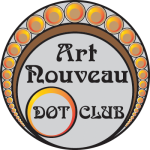 Eleven American cities from 8 different countries have been selected by artnouveau.club as The TOP 11 American Art Nouveau Cities ever. After an in-depth analysis of the Heritage of the cities and the state of the buildings, the ranking appeared with some surprises for the participant cities. Buenos Aires, the capital of Argentina, is on TOP, but other interesting cities appeared in the list.